Medical residency programs are highly competitive because of the federal cap on the number of residency programs available for new medical student graduates. According to the American Medical Association, an individual (in this case a medical graduate) is not considered to be entitled to access to a residency program. In fact, the American medical school system encourages competition and believes that this is an inherent part of the career process. Applying for a medical residency is like a bid for a limited number of contracts – the bidder has to convince the body or institution awarding a contract that they can fulfill all the necessary requirements better and more efficiently then other competitors! That’s basically the purpose of your CV residency application and research personal statement. What Should Be Covered in Your CV for Residency Application? Name and contact details: this is the first section of your CV and you should ensure that your contact information is correct. You should also ensure that any email is professional rather than something that would be more appropriate for high school friends. Skills: always carefully review the requirements of the residency program that you are applying to and identify the specific skills that they require; both hard and soft skills. Ensure that you reflect them within this section of your resume so it is clear at a glance you have what they are looking for. Education: start with your most recent qualifications and work back. Also, highlight any relevant research or papers that you may have published. Work history: this section should include all rotations, actual work, and any volunteer work that is relevant. Do not simply list your responsibilities, show what you have actually achieved during your work. Not tailoring your CV: your resume must always be carefully written to reflect the specific expectations of the residency you apply to. Just using a generic CV could cause them to fail to see something that they are looking for in your CV. Incorrectly formatting your CV: your CV must be clear and easy to read. This means using a format that has wide margins and plenty of white space so that it does not look cluttered. Making unsupported claims: don’t just say that you have a particular skill, they will want you to use brief examples to demonstrate them. Listing responsibilities: these are usually clear simply from a job title, instead show what you have achieved and learned. Not proofreading: simple mistakes can lose you any chance of selection. They say that either you were not interested in the position of that you are a poor worker. 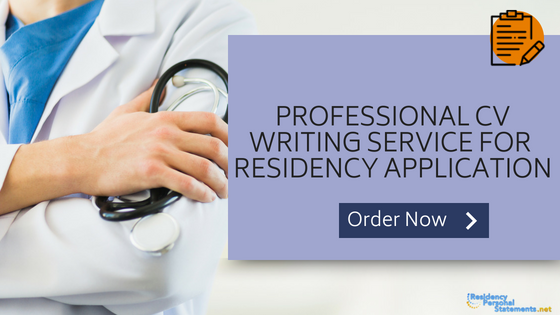 Whenever you need to submit a high-quality residency resume you must be certain it meets the standards of most medical residency program providers. We have a team of professional writers and professional editors to aid medical graduates to edit their CV for medical residency applications. We can create an entirely new professional CV from scratch to go along with your application. We may also assign a professional editor to check your CV for any spelling mistakes or inconsistencies. Our writers will also suggest changes to your residency CV and reformat your document. We provide only direct communication with coaches and writers. Students approaching their last year of graduate medical studies are one step closer to becoming a doctor. Once final step after medical school involves applying to a medical residency program whereupon you can finally start your training and realize your career! When applying for these highly competitive residency programs, you will definitely need a medical residency CV or a medical residency resume to highlight your previous experience, skills, complete educational background, awards or any other relevant information that will greatly increase the chances of being admitted. A medical residency CV will typically be one page in length. Admissions boards receive hundreds of applications for a particular spot – you have only a few seconds to capture their attention with your customized CV! 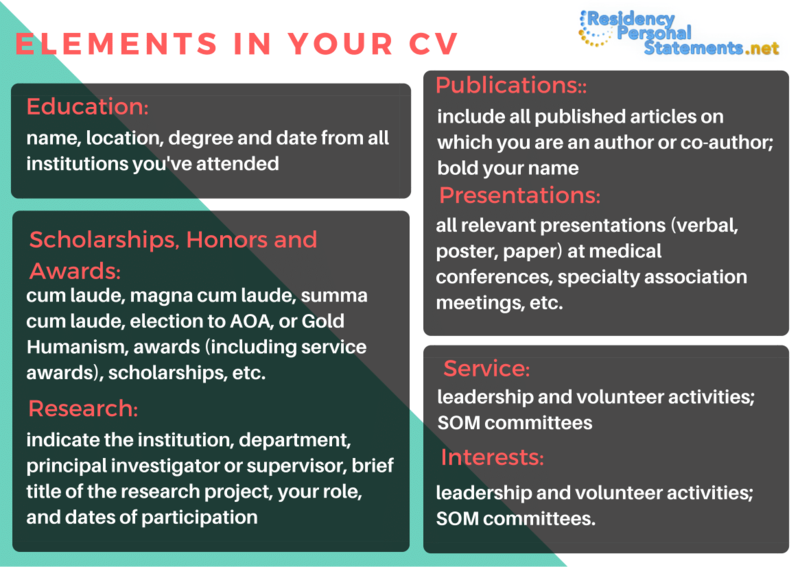 It is important to have a well-written, error-free and convincing CV residency document so that your medical resident resume can make a great first impression and stand out from all other candidates by selling your best qualities effectively and persuasively! If your residency application CV has errors, looks unprofessional or contains an inconsistency that confuses the admission board your entire application may possibly not receive any further consideration! Do not leave your resume for residency writing to trial and errors. Your residency resume or CV needs to stand out, it needs to impress the admission board and it needs to show that you are a future medical professional and the perfect candidate for a medical residency training position! Our team of professional writers knows that as a medical graduate, one of your most important goals is to get accepted into a residency program. Being accepted into the program of your choice will ensure your future medical career! CV format medical doctor writing help is able to supply you with the fountain of ideas on how to make your personal residency application document irresistible and suitable for each particular program, like pharmacy residency personal statement. Professional writers from our premium quality residency personal statement service will help you to suit the strongest features of your personality to the requirements and demands of the most intricate programs of the top colleges and universities where the competition is really tough. Learn how to make your medical CV sample from our posts or handle the task to professionals who have a great experience and the positive enrollment stats. We will help you to create a medical resident CV that will outshine the competitors and make your best features look more bright by providing supporting examples from your biography. This is why you should not settle for an average or cheap CV for residency applications. We have professional writers on staff you will gladly assist you wholeheartedly and produce a high-quality document with your success in mind. Direct contact with highly qualified writers and editors: each holds a postgraduate degree and is highly experienced with residency applications and what the programs expect to see. Highly affordable pricing: it is going to be difficult to achieve the quality that we can provide you through cheaper services. Original and error-free CVs, all of our services are provided with free proofreading and a free plagiarism report. On time: we will always get your CV completed within the deadline that you have agreed with us. Guaranteed satisfaction: we will ensure that you are fully satisfied or we will refund your payment. You have a chance to get your residency CV in one click. Choose our service today!